Thanks to Hanoi – Lao Cai express highway opened for traffic, many passengers switch from travelling by train to by car. In recent time, to deal with competition, Vietnam Railways has implemented efforts to enhance its quality services. 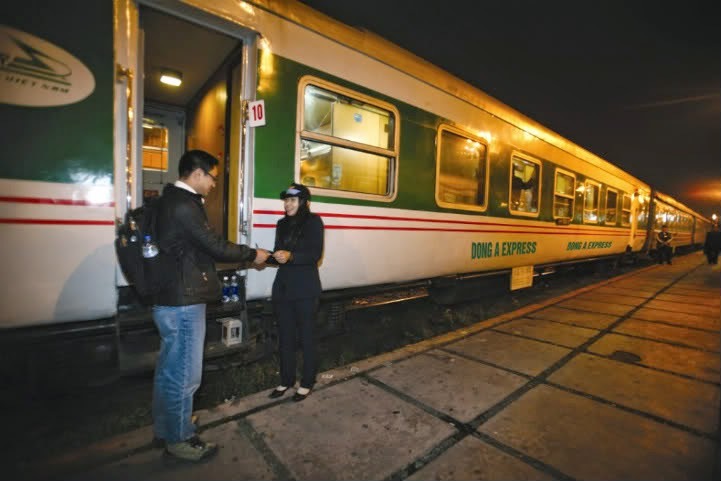 From 1st December 2014, ticket prices of Hanoi – Lao Cai train started to decrease by 3% to 25%. On 1st December 2014, Vietnam Railways Corporation officially regulated ticket fares of Hanoi – Lao Cai route for trains: SP1/2, SP3/4, SP5/6 and SP7/8, with a decrease of 3-25% depending on each category. This is the good news for travelers who tend to take a Sapa tour or Sapa trek and expect to have Vietnam train experience. However, this decrease is not applied for the national festival days, Tet holiday and peak times in summer. Accordingly, the lowest price of Hanoi – Lao Cai route is 145,000 VND (hard seat). To sleeper, the cheapest cost is 325,000 VND (air-conditioned berth in 6th department of 3rd floor). The ticket of hard seat declines from 150,000 VND to 145,000 VND while one of air-conditioned hard seat falls to just 175.000 VND (the former price is 235,000 VND). The fare for air-conditioned soft seat drops from 280,000 VND to 220,000 VND (a drop of 60,000 VND, equivalent to 25%). Specially, rates of air-conditioned sleeper of all departments also had regulations. Following this, many prices has a significant decrease of 22% to 25%. For instance, the cost of berth in 6th department 1st floor goes down from 500,000 VND to 390,000 VND; the price for sleeper in 2nd floor falls to 370.000 VND, the price of 3rd floor decrease from 415,000 VND to 325,000 VND (a decrease of 22%). The air-conditioned berth in 4th department of 1st and 2nd floor now has a price of 450,000 VND (the before cost was 600,000 VND, drop by 25%). On the Tet holiday 2015, Vietnam Railways Corporation (VNR) will slash train fares by 17% compared to current fares and 20% over the previous Tet holiday. The discount will be available for the North-South and Hanoi-Lao Cai routes, starting from December 1. Earlier, VNR launched a big promotion program, with 30-50 percent discount from September 4 to December 31 for tickets booked in advance with a distance of 1,300 km or more. Fares of sleepers were declined by 10% and discount was offered for groups. The Vietnamese railway sector has been making an effort to upgrade their infrastructure, equipment and management. Services are also set to be improved to win back passengers’ trust. On this time, Hanoi – Lao Cai railway has been upgraded and improved. As anticipation, the upgrade will be accomplished in the end of first quarter, 2015. After upgrade, the travel time between Hanoi and Lao Cai by train will be fell by 1.5 to 2 hours. Daytime trains will be also broadened to serve diverse demands of passengers. On 1st December 2014, VNR opened the system of online ticket booking for train through e-payment gateway issued by Smartlink Card Services Joint Stock Company and Joint Stock Commercial Bank for Foreign Trade of Vietnam (Vietcombank). Customers would not have to go to the station to buy tickets. They could do so from any internet-capable device. Passengers can access the websites selling e-ticket: www.dsvn.vn, www.vietnamrailway.vn or www.vetau.com.vn (all are Vietnamese) to look up information, select routes, cars and seats, proactively book tickets and make payment in sight on the by international as well as domestic credit cards in a flexible and convenient way. To be able to carrying out online payment transaction on e-ticket selling websites of VNR, customers need to register the online payment service or payment services via Internet Banking of banks (view instruction for payment at here). The online system would require passengers to provide full personal information and their Identity Card numbers so as to avoid fraud. After successful online payment, customers print booking code and bring it along with valid identification papers then coming to the train stations to take tickets. 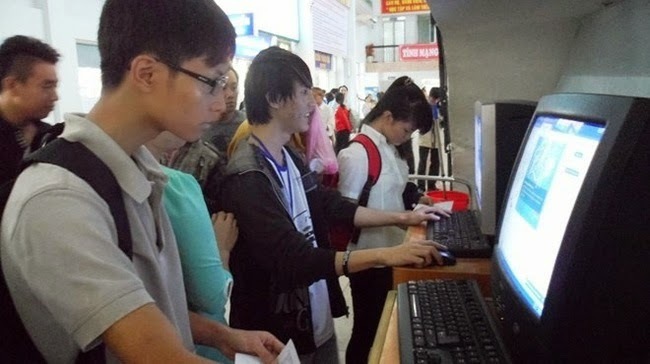 One customer is enabled to order a maximum of 4 tickets in Tet holiday and must go to train station to get tickets at least 30 minutes in advance before train departs. The online ticket system allows passengers to reserve seats 24 hours before the train departure time. To return train tickets purchased through online payment system, customers go to station to complete procedures and pay fee of ticket return. VNR will refund fares to bank account of customers within one work-day as from customers has accomplished ticket return procedures. In circumstance of making payment, customers contact with Customer Support Center of Vietnam Railways Corporation via hotline 19006469 for help. This is list of 23 domestic banking cards which are accepted to make a payment for train e-ticket of Vietnam Railways via e-payment gateway supplied by Smartlink and Vietcombank, including: Vietcombank, Agribank, BIDV, Techcombank, VIB, Eximbank, Military Bank, HDBank, ACB, Sacombank, VPB, Maritime Bank, NCB, Viet A Bank, GPBank, OCB, Ocean Bank, BacABank, ABBank, TPBank, LienVietPostBank, SHB, BaoVietBank. In this December, Smartlink continues to coordinate with Vietinbank and DongABank to provide online payment services of train e-ticket for domestic cardholders of these two banks. Up to 15 hour of the first day selling train ticket for Tet holiday (1st December), turn-over of online payment for e-ticket carried out via Smartlink e-payment gateway was barely 4 billion VND. Railway passengers in Hanoi and Ho Chi Minh City who have booked tickets and paid for them online can have their tickets delivered to their home for free at their request as of next month. Accordingly, after booking and paying for their tickets at www.dsvn.vn, www.vetau.com.vn, or www.vietnamrailway.vn, passengers in Hanoi can call 04.39423949 (the Hanoi railway station), and those in HCMC can call 08.38436528 (the HCMC railway station) to request their tickets to be delivered at home, provided that they do not live more than 7 km from the respective stations. Those who have paid for their tickets online but did not request home delivery are required to pick up their tickets at least 30 minutes before their scheduled departure.